Okay, I have to admit that I am not finished Christmas shopping yet, but it’s never to early to think about wrapping ideas, right? Today, we are looking forward to those last few minutes before Christmas when I will be madly wrapping goodies for under the tree! 😉 I know you will be done long before I will be! 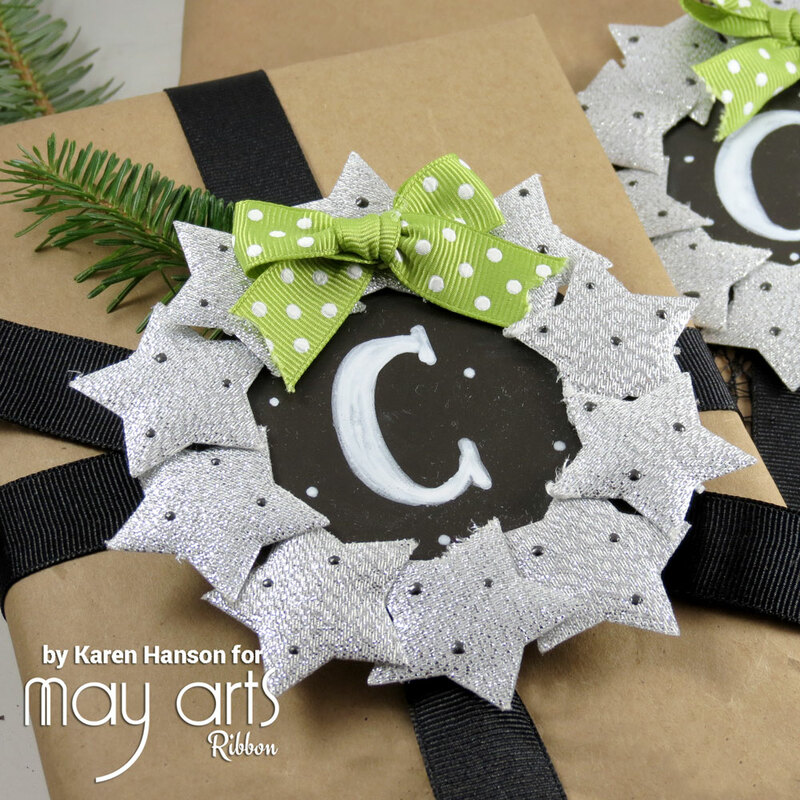 For my wrapping idea, I decided to team up some of the beautiful black ribbons available at May Arts with some krafty paper for wrapping, some chalkboard paper for a tag, and some fun metallic stars to create a wreath. The best part is that the tags are reusable – simply wipe clean and use them again. Switch the little coloured bow out and you could use them for birthday presents or other occasions too! To create the wreath, I simply cut out a circle (no fancy cutting machines needed – just trace a circe and cut – mine is about 2″ in diameter), and then layer your stars. I used hot glue to adhere each, but glue dots would work well too! So, there you have it! A simple wrapping idea for all you kraft paper lovers! Make sure you check out what all of the ladies have for you in terms of inspiration if you haven’t already! 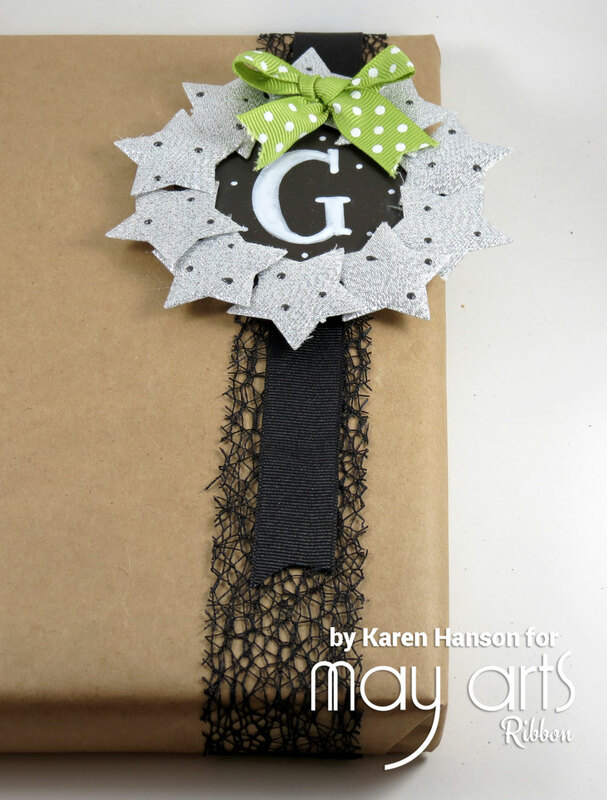 This entry was posted in Altered items, May Arts Ribbon and tagged chalkboard, gift wrap, star, wreath by Scrappy Canuck. Bookmark the permalink. very beautiful and can be used next year as an ornament on the tree! Love the simplicity and yet how stunning the packages look! Love the wrapping on this package. The colors are perfect together. Thanks for the details on how you made it. This is such a unique and beautiful wrapping idea! I like the chalkboard element and the fact that it can be reused. I just love the wreath idea withe the monogram. Your colors are very trendy. Looks great with the kraft and I like that the tag is reusable. What a sweet idea, making that wreath out of the star ribbon. With the kraft paper and the black ribbons it looks great. Thanks for sharing. LOVE your star wreaths with the pretty (& clever) chalkboard in the middle, LOVE your netting layered with the grosgrain and the polka dot bows – you have made plain old Kraft paper look SO ELEGANT and made it sound easy enough for me to do too!!! 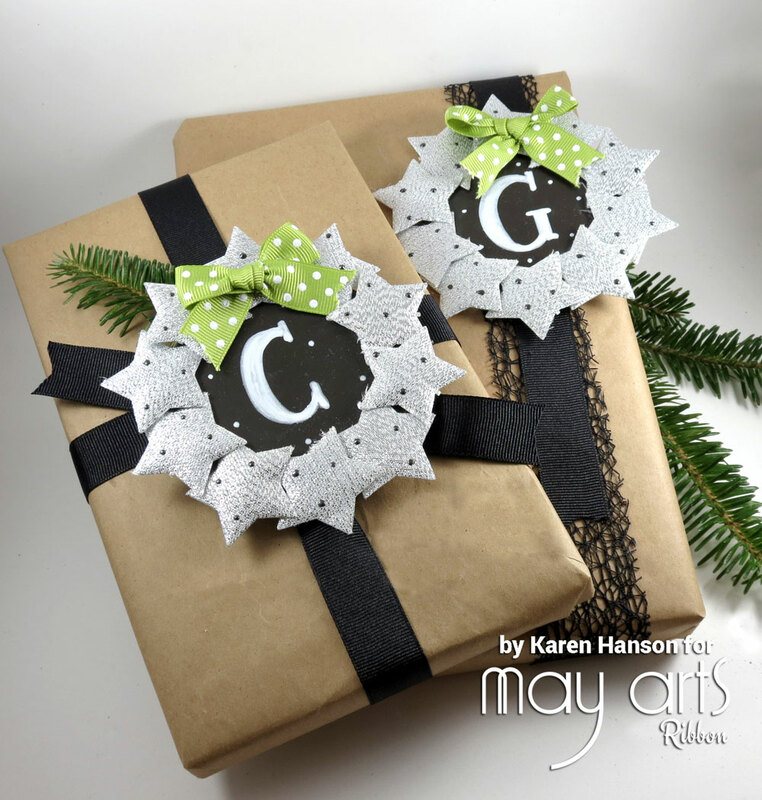 Great, LOVE your star wreaths, the chalkboard, the netting layered with the the polka dot bows. TFS.